This is a copy of a book review of Terrorism as Crime: From Oklahoma City to Al-Qaeda and Beyond by Mark S. Hamm, published in Contemporary Sociology 37(1):62-63, 2008. Please cite as: Deflem, Mathieu. 2008. Review of Terrorism as Crime: From Oklahoma City to Al-Qaeda and Beyond, by Mark S. Hamm. Contemporary Sociology 37(1):62-63. This book is introduced as a study of crimes related to terrorist activities. Terrorism-associated crimes are instrumental in aiding terrorist causes by providing logistical support in the form of money, weapons and other materials, training and personnel, and safe havens and transportation for terrorists. Among the relevant crime are drug trafficking, weapons procurement, passport forgery, immigration violations, and terrorist training programs. Relying on insights from routine activity and learning theories, author Mark Hamm looks at the opportunities for and skills involved with these crimes of terrorism. The author applies the approach to six case studies of terrorist incidents and groups, which were selected because of the extent of their criminal involvement. Methodologically, the book relies on trials transcripts, interviews, and documentary sources. The author’s perspective is explicitly oriented at contributing to formulate adequate policy responses to terrorism by means of the study of past failures and successes in terrorism activities and their prosecution. The book thereby seeks to defend the argument that strategies of counter-terrorism should focus on the criminal dimensions of terrorist activities. Briefly reviewing the case studies, the first chapter of the book concerns the World Trade Center bombing of 1993. Hamm provides information on the background of the perpetrators and how they garnered the means to commit the attack. Because the ultimate goal of bringing the towers down was not successful, Hamm argues the case to be one of ‘criminal stupidity.’ The second chapter details the background, organization, and strategy of the two related cases of the U.S. embassy bombings in Kenya and Tanzania in 1998. Turning to domestic terrorist organizations, Hamm next tells of the background, conditions, and participants of the rise of ‘The Covenant, the Sword, and the Arm of the Lord,’ an early 1980s survivalist group that planned various attacks against the U.S. government and that was eventually involved in a stand-off with the FBI. The topic of the fourth chapter is the ‘The Order,’ a neo-Nazi group whose members were convicted on racketeering charges in 1985. Subsequently detailed is the history of the Aryan Republican Army, a supremacist group involved in bank robberies in the early 1990s. Hamm suggests that the group was involved with providing logistical support in the Oklahoma City bombing of 1995. In the book’s final chapter, Hamm returns to the international scene to detail some of the post-9/11 adventures of al-Qaeda and that group’s diffusion into self-starter cells on a global scale. The title of the book is misleading because it is meant to deal with crimes related to terrorism, not terrorism as crime. 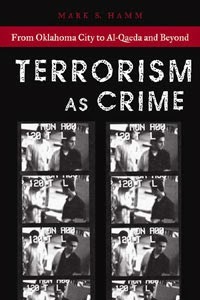 Thus the attention of this book is shifted away from terrorism itself and prevents a theoretically sustained treatment of terrorism in terms of the conceptual tools of criminological sociology and other perspectives in the domain of criminology. A more accurate title of this book, on the basis of its own ambitions, would have been, ‘Crimes of Terrorism.’ Yet, despite this ambiguity, it is a matter of scholarly license to focus attention towards a dimension of terrorism that, indeed, is often neglected. However, turning to the book’s case studies, it is clear that this work does not deliver on what its author set out to do. This book is not a criminological investigation of crimes associated with terrorist acts and organizations, but instead is a mere descriptive account of the background and conditions of a number of terrorist groups. The descriptions are very detailed, and one may also assume them to be accurate, as accurate as the investigative case files upon which they are based. But restricted to a chronicle of events, the book does not contain any theoretically sustained analysis of the cases. Instead, the author merely recounts the conditions and skills involved in the selected cases and then argues that counter-terrorism experts should take these elements into account. The approach of this book is lacking on two basic grounds. One, it does not involve a sociologically or otherwise criminologically relevant analysis of the causes and dynamics of criminal activities associated with terrorism. Rather than testing or applying routine activity and learning theories of criminal conduct, this book merely identifies the opportunities and skills involved in selected criminal cases, without making a case for the relevance and dynamics thereof. To argue that some level of skill and some degree of opportunity is needed for a crime to take place is to argue nothing at all. Two, the identification of opportunities and skills in criminal activity can indeed lead to shape policy on and responses to terrorism to be more effective, but such identification can be —and is— conducted by investigators and prosecutors much better and more usefully than by any sociologist or criminologist. As such, this book provides a manual of counter-terrorism based on a summarization of criminal files, instead of a scholarly contribution from which other researchers can learn how to study terrorism and terrorism-related issues. Identifying the most and least successful methods of planning and executing a crime is a matter of criminalistics, not criminology. To the otherwise valuable argument that U.S. counter-terrorism is dominated by a military model this book offers no foundation. Besides, such an argument would require an analysis of counter-terrorism, not terrorism. Lacking in analysis, this book has little if any relevance to criminological sociologists and other criminologists interested in studying and understanding the many dimensions of terrorism. See related writings on terrorism and police.